Stahl-Syberg supplies explosion-proof products, in addition to related systems and services, to internatonal offshore companies based in Norway. The company serves the gas and oil, chemical and pharmaceuticals industries. 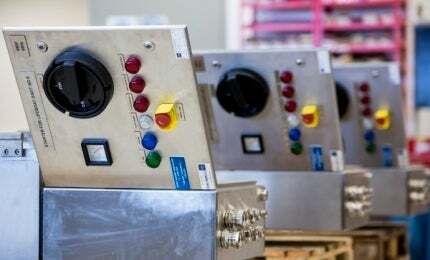 Stahl-Syberg provides a wide variety of switchgear and lighting packages for offshore companies. The company’s switchgear and lighting packages include a customised electrical system according to the client’s specifications, electrical engineering and mechanical design services. Stahl-Syberg’s solutions are suitable for refinery, and onshore and offshore recovery / drilling and exploration platforms. Stahl-Syberg offers explosion-protected lighting, ranging from tank inspection lamps and floodlights to emergency lighting. All products cover all ignition protection classes. The company provides project management and planning services, and creates customised lighting and complex emergency lighting systems. Stahl-Syberg offers a wide product portfolio, supplying components for system technology to clients looking for tailor-made solutions. The company specialises in flameproof encapsulation (Ex-D) and increased safety (Ex-E) technology, as well as components for Ex-D and Ex-E enclosures. Stahl-Syberg offers explosion-protected command systems and signalling devices, which includes durable standard units and customised system combinations. Stahl-Syberg’s installation materials includes explosion-protected cable glands for various ignition protection classes, stopping plugs to seal unused enclosure bore, breathing glands for maintaining enclosure pressure, explosion-protected cables for enclosure power supply, and other accessories. Stahl-Syberg’s cameras supply surveillance and industrial process monitoring for adverse environments. Designed to operate in temperatures ranging from -40°C to 75°C, the company’s lightweight and robust surveillance systems include open process and security cameras, enclosures and software packages. They can be used in Zone 1 and 2-type environments.